Acclaimed author and comic book writer Grant Morrison is renowned for many things, but subtlety isn't one of them. HIs latest project is so audacious, YouTube chose it as one of the main tentpole events christened to launch its new celebration of geekdom, Geek Week. 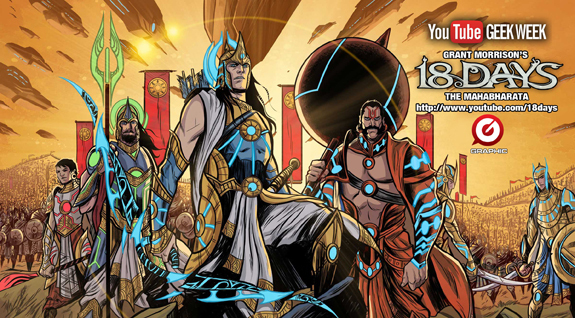 18 Days is Morrison's animated, graphic retelling of the epic Indian poem Mahabharata. At least eight times longer than Beowulf or The Odyssey, the Mahabharata chronicles ancient tales of Indian mythology, and even contains seeds of the origin of Hinduism. Central to the work is the recounting of a monumental war between two clans of demigods - the Kauravas and the Pandavas - as they engage in a cosmic conflict that will determine the fate of all mankind. The Mahabharata is filled with intrigue, battle, conflicted heroes, demons, and gods. It's a perfect work to be adapted into a modern action-adventure fable. In order to bring his adaptation of this epic to the screen, Morrison collaborated with Graphic India, the Indian entertainment firm co-founded by Gotham Chopra (the son of Deepak Chopra). Graphic India - with its mission to create dynamic characters and stories for the Indian youth market - is the ideal partner to collaborate with Morrison on 18 Days. The result is an expansive animated series of incredibly gorgeous art, combined with a trippy and surreal premise filled with themes that are quite universal. I highly recommend 18 Days not only because of its grand scope, but also because it's a vast departure from typical and rote superhero action fare. In order to view all current and future episodes, you can only watch the series on its exclusive YouTube channel: 18 Days.